Hello everyone; hope you’re ready for the weekend. The weather’s getting chilly; not long now till Christmas is on it’s way! Isn’t that exciting. Less than 30 days until I am back on home soil to watch one of my closest friends get married. I just can’t wait. I have been watching interestingly the commentary on social media regarding the controversial “Sainsbury’s” Christmas ad. I have to say, I can see both parts of the argument, but am inclined to go with the Guardian on this. Advertising using the subject of any war for commercial gains is pretty tasteless, on on the flip side I can see that the advert was beautifully done, and really pressed home beauty of Christmas and humanity in such arduous circumstances. The only problem, the First World War wasn’t beautiful…. Anyway, back to the weather. Gone are the days when a delicious salad hits the spot at lunch or dinner. Even in California, I have the heating on!! As a kid, I always loved stodgy potato chowder. In winter, when it’s cold, soups and chowders are my go to meal for lunch or dinner. Here’s a recipe that I am obsessed with at the moment. I have taken the standard chowder, and made it paleo. 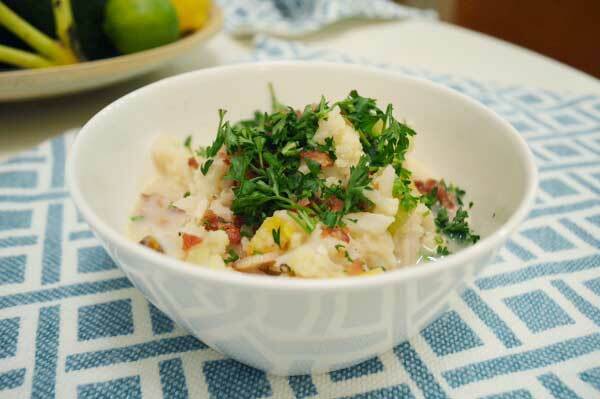 Gone are white potatoes, replaced with lighter, and even more delicious pieces of cauliflower. I have road tested this recipe with a number of people, and everyone’s given me the thumbs up- You can make it in big batches and reheats really well. Perfect for portable lunches or back ups when you’re late home from work. In a large casserole dish, add the diced onion to a pan and fry in 2 tablespoons of olive oil for around 3 minutes. Add the cauliflower to the dish, and sprinkle coconut flour, ensuring the cauliflower pieces are covered evenly. Add the chicken stock and simmer for 20 minutes until the cauliflower is soft. Stir regularly. Add the ghee to the dish and stir. Season with black pepper. Add the carrots and celery and allow to simmer for around 10 minutes. Meanwhile, fry the diced bacon for around 5 minutes until crispy and set aside. Stir the chowder and season to taste. 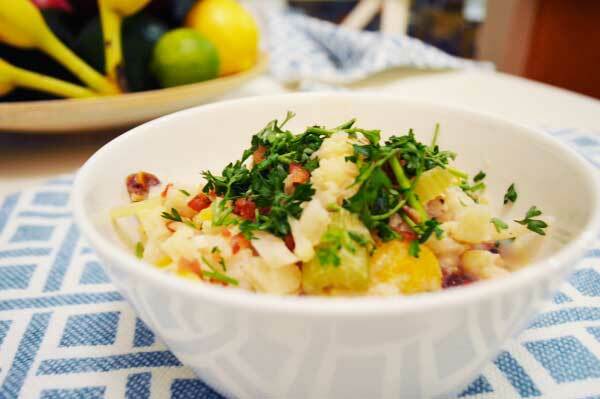 Serve in large bowls, garnish with crispy bacon pieces and fresh parsley!